We estimate the full lifecycle emissions of building and operating the Rover Pipeline, which Energy Transfer Partners – the same company behind the Dakota Access Pipeline – is currently building across the states of Pennsylvania, West Virginia, Ohio, and Michigan. This is the fourth in a series of briefings on the climate impact of new gas pipelines in the Appalachian Basin, and the Rover project is the largest under development. We find that the Rover Pipeline would lead to annual emissions of nearly 145 million metric tons of carbon dioxide equivalent. This would be the equivalent of adding 42 coal-fired power plants or over 30 million passenger vehicles. We also examine how the Federal Energy Regulatory Commission (FERC) used flawed and outdated assumptions in its own climate assessment of the Rover Pipeline, which led to the agency’s dismissal of the project’s significant climate impact. Energy Transfer Partners’ construction of the Rover Pipeline has caused a string of spills and air and water violations. We conclude that FERC should reopen the permit case and conduct a supplemental Environmental Impact Statement to more adequately address both the safety hazards of pipeline construction and the project’s lifecycle greenhouse gas emissions and climate change impact. 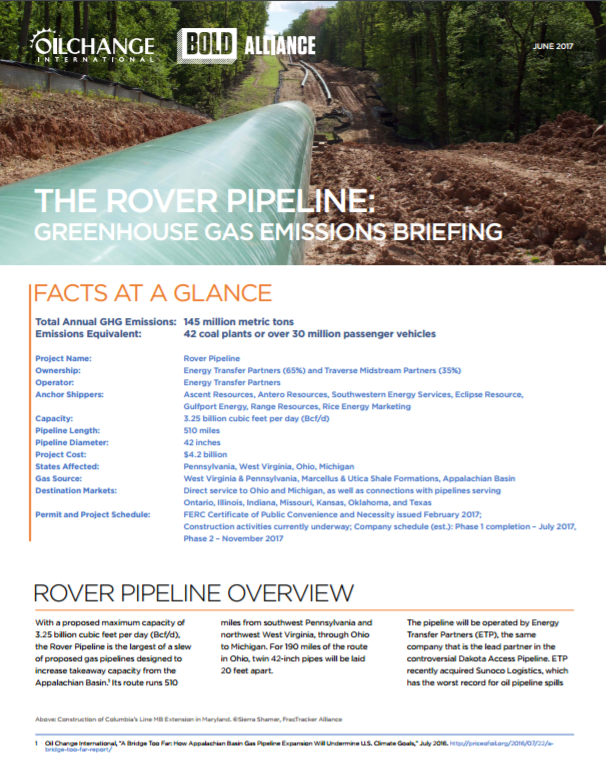 The Rover Pipeline Greenhouse Gas Emissions Briefing is based on Oil Change International’s Gas Pipeline Climate Methodology. Time has moved on, fossil fuel industry. You are being left behind as renewable sources of energy, initially for electricity generation, but soon for transportation as well, renders you obsolete. Do the right thing for the climate, the environment and your shareholders by shifting away from these profoundly damaging and ultimately obsolete technologies. We will resist you ever step of the way until you do. America needs to change and step up to clean energy. Unfortunately no one really wants to see wind turbines out their window or a solar panel farm. Gas and oil will be king for a long time to come but change is needs, coal needs to be phased out completely as soon as possible. But until electric powered cars and truck can go the distance and speed people want change will be very slow.